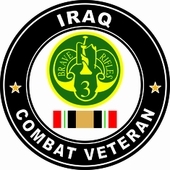 Our 3rd Armored Cavalry Regiment Operation Iraqi Freedom Combat Veteran Vinyl Exterior Decals are 5 inch, all weather vinyl decals and guaranteed for 5 years. These transfers are made exclusivley for us by one of our associate companies. This transfer is MADE in the USA.